Statistics show that respect for human rights, including children’s rights, deteriorated alarmingly in Norway between 2008 and 2015. An enormous increase in emergency placements has, in many cases, put the authorities in a position of not only breaking the law, but also of violating the basic human rights of children and parents. Around eighty-five to ninety per cent of all ‘care orders’ executed in Norway today come via an urgent resolution, which represents a significant shift compared with just a few years ago. The rule of law has diminished drastically since 2008. This means that only ten to 15 per cent of all care placements in Norway constitute mainstream placements under the Child Welfare Act’s ‘Decree to take care of a child’ stipulation § 4.12 (a type of care placement that gives the child a significantly greater rule of law). Emergency decisions should only be used if children would be significantly harmed by remaining at home with their parents. They should only be used in extreme and exceptional cases, for example if there is an immediate and significant threat to a child’s health or development. Emergency decisions are processed by the county board. However, the county board doesn’t directly consider the parents’ ability to competently care for their children. Instead, it relies on the report from Norway’s Child Welfare Service (NCWS) and checks whether it is in line with the law. The review of an emergency decision happens first in court, often three to four months after the emergency decision was made and executed, and after the child has been placed in a public institution. Of all emergency decisions, the county board upholds around ninety-five per cent, which means that if a case gets to the county board stage children only have around a five per cent chance of staying with their parents. The ministry sees the sharp increase as a cause for concern because emergency placements create poorer legal protection for the affected parties than the ordinary position after bvl. § 4-12, and because an emergency placement may represent a disproportionate intervention for children and parents if it later turns out that there was no basis for relocation. 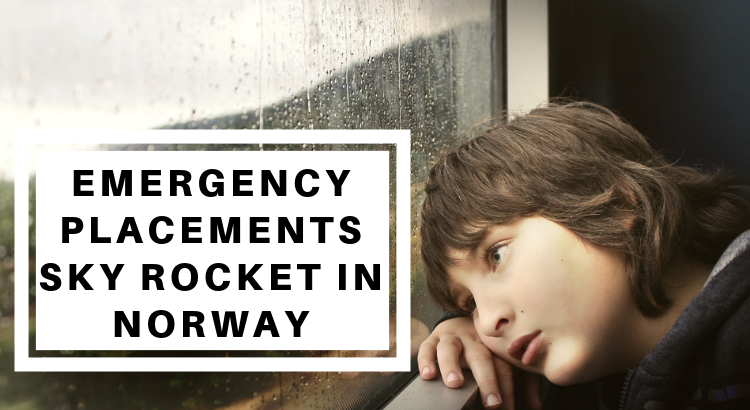 An extensive use of emergency placements could conflict with Norway’s obligations under the European Convention on Human Rights Article 8 and practice for this. Although the Norwegian Ministry of Children, Equality and Social Inclusion asked local authorities to restrict the implementation of emergency decisions in 2008, Norway saw a rapid increase during the seven years that followed. Statistics show that 1,504 emergency decisions were made in 2015, an increase of sixty per cent. What is the reason for such an astonishing rise in emergency placements? Are there significantly more serious issues today? Is there a greater need to protect children that might justify this? Are parents more wicked compared with a few years back, or compared with other countries around the world? Sadly, this trend is set to continue as a newly proposed child welfare law that would exercise far greater control over children and their families in the future is being considered by the Norwegian government. This proposed new law would represent a huge setback for human rights and democracy in Norway. Why is the existing moral framework being firmly swept away, and why is the rule of law being shoved into the gutter, causing the family to be woefully brushed aside? Has NCWS become a family bulldozing business? Barnevernet literally means ‘child protection’, but is this a good translation, considering the trail of devastation and trauma this agency creates for so many normal families? NCWS is a very good example of an agency displaying systemic failure. Thousands of children have been taken away from good parents over the years and placed with strangers in foster homes. Around 55,000 children received involuntary ‘help’ from NCWS in 2016. This is a significant number for a population of around five million, and it is worth noting here that many of its stakeholders are economically dependent on the child welfare system, including psychologists, lawyers and county boards.